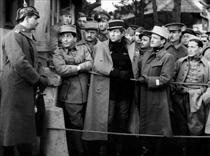 Overview - During the thick of World War I, a German POW camp holds a group of French prisoners, including the aristocratic Boieldieu (Fresnay), Maréchal the foreman (Gabin) and the Jewish banker Rosenthal (Dalio). The trio prepares to make their escape, but is soon moved to a seemingly impenetrable fortress. People often believe what they want to believe, choosing to latch onto skewed perception rather than face the truth of reality. Grasping at phantasmal straws, we hold tight to falsehoods, letting ourselves fall victim to invisible class barriers and ever-elusive hopes. We segregate ourselves based on deceptive logic and further false optimism for dreams we dare not let go -- for if our superiority isn't real, if the fantasy isn't real, what's left? Often revered as one of the greatest films ever made, Jean Renoir's 1937 masterpiece, 'La Grande Illusion,' presents a stirring, emotionally charged anti-war treatise that examines the fragile illusions of class distinction, racial divides, and the ever-approaching promise of lasting peace. While the film's themes might deal heavily with misconception, Renoir's cinematic achievement itself is no sham, no lie, no parlor trick. This is the genuine article. This is one of those rare, virtually flawless works of art. This is real magic. Set during World War I, the story follows a gang of French soldiers being held in a German POW camp. Though seemingly well taken care of by their surprisingly gracious captors, the group decides to try and make a break for it. Unfortunately, their efforts are repeatedly dashed, and soon they find themselves under the watchful eye of Captain von Rauffenstein (Erich von Stroheim). Held in his massive fortress, escape looks to be impossible, but for Lieutenant Marechal (Jean Gabin), Lieutenant Rosenthal (Marcel Dalio), and Captain de Boeldieu (Pierre Fresnay), the impossible is merely improbable. As class distinction, racial divides, elitism, and other illusory concepts bear down upon them, the prisoners band together to form an ingenious plan -- but will misdirection and deception be enough to escape? Teeming with rich thematic material and multilayered characterizations, the film forms a striking, humanistic portrait of war, brotherhood, sacrifice, and self-imposed deceptions. A charming, slightly satirical sense of humor also permeates the work, and despite the sometimes grave subject matter, the movie carries a surprisingly light tone -- one that mirrors the characters' own paradoxically upbeat attitudes under their supposedly dire circumstances. But then again, are they so dire? Throughout much of the runtime, the prisoners are frequently treated like welcome guests, revealing an unexpected air of civility between enemies. At times, the French officers appear almost oblivious to their predicament, carrying on with luxurious meals and, in one of the film's most memorable scenes, an absurd musical performance. It's not all fun and games, however, and said performance does actually end with an unexpected action that brings weighty consequences. Still, there is a certain level of chivalry and politeness that pervades much of the French/German interactions. Is this habitual respect merely an illusion, an unconscious action simply born out of routine? Or is it truly genuine, effectively exposing the frailty of imposed hostility and national divides? Like many cinematic masterpieces, the film's thematic underbelly is so deep that it engenders numerous interpretations. Contrasting with this pleasant air of shared respect, is a much more unsavory undercurrent of elitism and superiority that runs throughout the picture. For some characters, social status actually seems to be more divisive than military rank or allegiance. Captain von Rauffenstein displays an elitist distaste for several prisoners, but not because they are French. No, he dislikes them because they come from a lower class or an "inferior" race. The working-class Marechal and Jewish Rosenthal particularly trouble him, but in the aristocratic Captain de Boeldieu, Rauffenstein finds what he perceives to be an equal. The two go on to develop a fascinating relationship which serves to illuminate many of the film's most intriguing insights. In many ways, Boeldieu can relate to the German captain even more than his own men, but that doesn't mean he shares Rauffenstein's distorted sociological view. In fact, his hateful comments have the opposite desired effect, which leads to a wonderfully ironic climax. As repellent as some of Rauffenstein's classist and anti-Semitic opinions are, through Renoir's direction and Stroheim's performance, he remains a multi-dimensional and at times, even sympathetic villain. Likewise, all of the prisoners manage to be distinct and layered, enhancing the rich thematic content with equally deep characterizations. 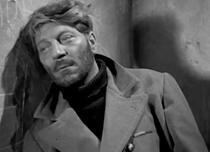 Gabin, Dalio, and Fresnay are all masterful in their roles, adding nuances to their personalities and relationships. Much of the third act relies heavily on the pairing of Rosenthal and Marechal, and together both performers create an endearing and affecting bond. The movie deals significantly with the idea of brotherhood, and the various complicated friendships that form between the prisoners (and even their captors) are full of emotional resonance. Furthering the film's dense themes and characterizations, Renoir imbues the proceedings with an effortless sense of visual realism, using his camera to gently guide the viewer through deceptively modest framing and movement. Like in his seminal classic, 'The Rules of the Game,' the director often employs a reframing camera, frequently forgoing traditional cuts in favor of long takes with various tracks and pans. Actors crowd continuous master shots filmed with deep focus, allowing Renoir to cover all that he needs to in an economical and unobtrusive manner. The camera will move from character to character when appropriate, keeping the image alive and uninterrupted, sustaining the illusion of reality. The long takes and reframing lens all help to further the busyness of the camp, making it feel alive and active, even beyond the edge of the screen. Specific movements aim to draw thematic parallels and imply meaning, such as a brilliant shot that scans over Rauffenstein's room and possessions. From there, without cutting, the camera then focuses on the Captain's subordinate as he fetches him coffee, before the frame finally rests on Rauffenstein's white gloves and obscured profile, never giving us a clear view of his face. The connections we make through the images presented, inform our impression of the man, telling us all we need to know through specific visual and contextual associations alone. Another later sequence perfectly demonstrates the director's penchant for artistic, economical compositions. Rosenthal and a female character (played by Dita Parlo) have a conversation about Lt. Marechal near a closed window. The woman exits the frame, and then Rosenthal opens the window, revealing Marechal standing nearby outside. The two friends, now in frame together, then continue to have their own conversation. Instead of piecing out the sequence into separate shots, the director finds a way to compose the scene where only one is necessary, and then even goes a step further by enriching the emotional subtext through blocking. Almost every sequence throughout the film is full of similar, meaningful cinematic form, as the director fills the screen with effortless, memorable images. Renoir's timeless masterpiece is packed with illusions of all shapes and sizes. Even the elaborate misdirection that rests at the heart of the prisoners' escape could be interpreted as an illusion -- in fact, one might say a rather grand illusion. Could that actually be what the ambiguous title alludes to? Or is it more internal, more symbolic? Is it the illusion of freedom itself? Of hope? Of civility? Of racial divide? Of class distinction? Of a war that actually has an end? The latter seems to be the most probable candidate -- but then, what of the illusion of kindness? Of brotherhood? Of sacrifice? Of love? No. As the film so beautifully reveals, those turn out to be real. 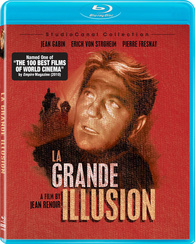 Lionsgate brings 'La Grande Illusion' to Blu-ray under its StudioCanal Collection. The film is presented on a BD-50 disc housed in a keepcase. Upon start-up a screen appears prompting the user to select one of three languages (English, German, or French) before the disc transitions to a standard menu. The packaging indicates that the release is region A coded. The movie is provided with a black and white 1080p/AVC MPEG-4 transfer in the 1.37:1 aspect ratio. Painstakingly restored from its original negative, the film looks quite astounding and at times revelatory on Blu-ray. After being meticulously cleaned and repaired, the source print is in absolutely exceptional condition. Sure, there are some minor specks, scratches and lines here and there, but major damage is essentially nonexistent. A light layer of grain is visible throughout, giving some nice, filmic texture to the image. The movie appears to have an inherently soft appearance, and while that's not necessarily a bad thing, it does lead to an occasionally blurry quality that lacks fine detail (especially in facial features). Still, despite this minor fuzziness, overall clarity is very pleasing and even striking at times. I was especially surprised by the amount of dimension evident in certain shots, and the welcome depth shows off Renoir's rich compositions and layered framing wonderfully. Whites are bright and offer nice pop, but blacks look a little faded at times. With that said, the disc includes a before and after demonstration of the restoration, and the unaltered negative has incredibly poor contrast and an exceedingly washed out look. While the end results still leave just a bit to be desired, the difference is really night and day. With this restoration, a treasured film classic gets the high class video presentation that it deserves. There is some inherent softness to the original cinematography and blacks are just a tad faded, but the overall image is incredible. This is the best the film has looked in ages, and given the negative's complicated history (as detailed in the special features) it's a miracle we get to see the movie in such fantastic shape. The audio is presented in a French DTS-HD MA 2.0 mono track with English and German subtitles. A separate German dub DTS-HD MA 2.0 track is also included. Despite the film's age, the audio is quite good and is free of any major issues. Dialogue is surprisingly full for a movie of this age and is mostly free of the muffled quality found in other classic film mixes. Speech is still comparatively tiny and thin, but not to the extent that one might expect. Music is a bit strained but comes through with acceptable fidelity. Dynamic range is on the flat side but there is no notable distortion. Some background hissing is audible from time to time, but really isn't troublesome, and for the most part the track is actually quite clean. For a seventy five year old film, 'La Grande Illusion' sounds great. There are of course certain limitations inherent to the source recordings, but by and large this is a very respectful presentation. Lionsgate and StudioCanal have put together a solid collection of supplements that trace the film's complicated history and restoration process. All of the extras are presented with DTS-HD MA 2.0 audio. Introduction by Ginette Vincendeau (SD, 12 min) - Film critic and professor Ginette Vincendeau provides an introduction to the film. Vincendeau discusses the movie's complex history and themes, and also offers some analysis of the film's title and one of its most famous scenes. The Original Negative (HD, 12 min) - Presented in 1080p in French with optional English and German subtitles, this featurette details the complicated path the film's original negative went through before being discovered and restored. Success and Controversy (HD, 23 min) - Presented in 1080p with French audio and optional English and German subtitles, this supplement features Jean Renoir expert Olivier Curchod discussing the film's different versions and various controversial interpretations. Much of the time is dedicated to Curchod dispelling a rather absurd accusation that the movie is somehow anti-Semitic. Like Curchod explains, this couldn't be further from the truth. John Truby talks about 'La Grande Illusion' (HD, 4 min) - Presented in 1080p with English audio, here script doctor John Truby discusses the film's themes and reveals how the movie has inspired his own approach to writing. Restoring 'La Grande Illusion' (HD, 3 min) - Various split-screen before and after comparisons are shown, revealing the dramatic improvements made to the print through restoration. The removal of various tears and rips are especially impressive. Trailers (SD) - The film's original 1937 and 1958 re-release trailers are included. With its gorgeous cinematic form, emotional story, and infinitely deep thematic content, 'La Grande Illusion' cements itself as a seminal work of motion picture art. Renoir weaves a heartfelt, humanist tale about friendship, sacrifice, and the illusory divisions of class and warfare. Simply put, this is one of the greatest films ever made. Beautifully restored from the original negative, the video transfer looks fantastic. There are some inherent limitations with the source recording, but the audio mix is quite good. Supplements offer decent insights into the movie's complicated history and restoration. This is a classic in every sense of the word, and thankfully the StudioCanal Collection has provided the film with a very worthy presentation. Highly Recommended.